Of the more than 200 million people infected every year with worm parasites released from snails, 20,000 to 80,000 will eventually die. McGill parasitologist John Dalton and his team have discovered how these killer parasites have managed to live inside our bodies, apparently invisible to our immune systems. In fact, worm parasites actually manipulate our immune systems to shut-off the inflammatory responses that we need to eliminate them. “These worms are masters of immune manipulation,” Dalton said. Dalton’s findings not only support the development of new treatments for these types of infections but, through imitation of the parasites’ behaviour, also open the door to research into better treatments for inflammatory diseases. In general, worm parasites, or helminthes, infect more than a third of the world’s population. Dalton studies two of the most prolific kinds. Currently endemic in 70 subtropical countries in Africa, Asia and Latin America, Schistosoma mansoni (also known as “blood fluke”) cause the disease Bilharzia and can survive in the host for 20 years. Water-borne snails release this parasite into fresh water sources. The parasite finds a human by sensing the chemicals on our skin before it burrows through into the blood stream and begins to breed. The second type of parasite, F. hepatica, or “liver fluke,” is also released by aquatic snails. But in this case, the parasite settles on grass and other vegetation and is contracted by eating. The waterborne parasite is an important cause of disease in cattle and sheep globally. However, Dalton’s team and others have shown it is a major emerging cause of infection of humans, particularly in South America and Asia. Once contracted, the worms survive by shutting off the body’s pro-inflammatory response. Although it can be harmful in itself, this inflammation is the body’s major defence mechanism and is the key to fighting infections such as those caused by viruses and bacteria. The worms achieve this by releasing proteases once in the blood stream. Proteases are enzymes that break down proteins and are found in all organisms (they’re also used in some laundry detergents!). The enzymes are then taken up by macrophages, the white blood cells that would normally provoke a pro-inflammatory response. Once inside the macrophage the protease shuts down the inflammatory-provoking response by switching off key cellular signals. 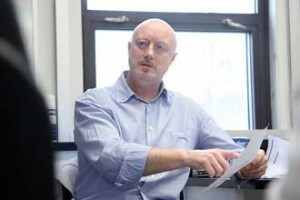 Dalton’s study, conducted on mice in collaboration with colleagues in Ireland (Dr. Sheila Donnelly, Sandra O’Neill) and Australia (Mark Robinson, Colin Stack, Lynne Turnbull and Cynthia Whitchurch), is the first to describe a parasite molecule that can silence the macrophage. It is also the first to pinpoint the novel mechanism by which parasitic worms modulate the innate immune responses of their hosts to suppress the development of responses. These masters of immune manipulation not only teach us fundamental lessons about the immune system, but also offer novels ways of treating inflammatory diseases such as diabetes, inflammatory bowel disease, Crohn’s disease, and arthritis.